The first indication that the Reds were really looking at him, Steve McCarthy recalled, came after one of his college starts for Brown University. McCarthy was walking with his then-girlfriend and the scout who eventually signed him, Mickey White, approached him. White needed some information from McCarthy. "He started asking me some detailed questions," McCarthy recalled, "and he said 'We're looking at you seriously.'" The Reds eventually did draft him and McCarthy called the round in which they did - the 11th - a nice compliment. McCarthy recalled the selection was also the culmination of the years of work he put in with the help of his father next to him. "I was really proud," McCarthy recalled. "My dad and I spent a lot of hours playing baseball together. I was very happy to be able to do something for him based on how much he does for our family." What McCarthy's father did included taking care of McCarthy's older brother and his younger brother, both of whom had forms cerebral palsy and other difficulties. McCarthy went on to a playing career that spanned five seasons. He never made the majors, but he has gone on to a successful post-playing career. He now runs a small computer hardware consulting business. 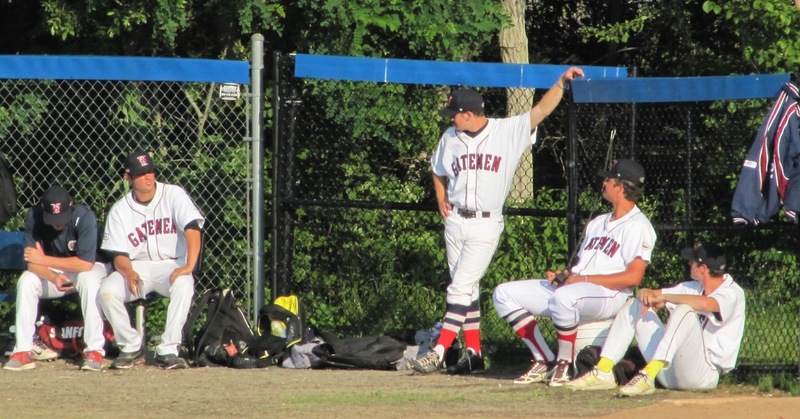 He spoke with The Greatest 21 Days recently on Cape Cod, a few miles from Falmouth, Ma., where he once played in the Cape Cod League. He and his family were on vacation, as was The Greatest 21 Days. He took about an hour out of that vacation to tell the story of his career. 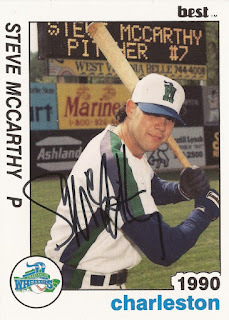 It was in the Cape Cod League during the summer of 1986 that McCarthy first thought he could turn pro. 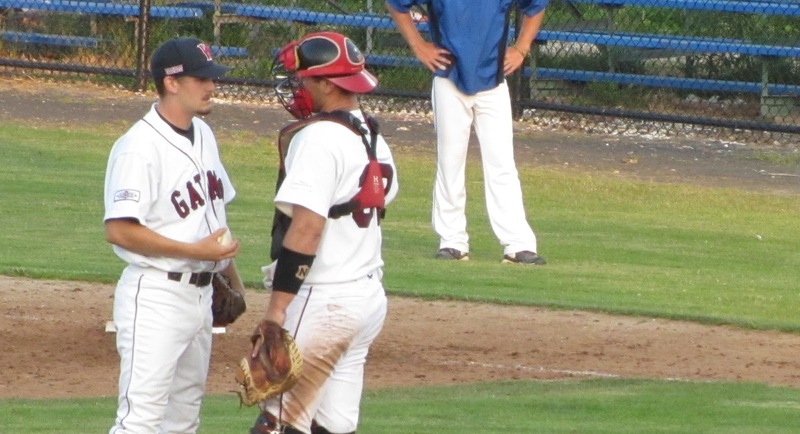 He'd played briefly for the Wareham Gatemen the previous summer as a late-season replacement. He recalled not doing much then, but he did get a look at the league. "It was pretty fun to watch baseball played the way it was intended to be played," McCarthy said. 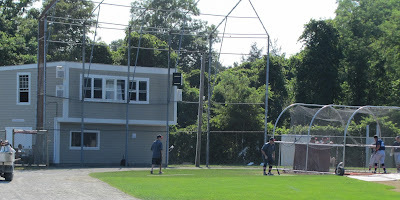 That included the fundamentals of inducing ground balls for double plays and understanding the guys backing up the pitcher in the field are good, too, and will make the play. With his Wareham time in, McCarthy hoped for a return trip the next summer. The invite never came. Instead, he had to hope for a slot as a walk-on. He tried out for Falmouth and he made it. The Commodores had an opening for a left-handed pitcher and McCarthy filled the bill. McCarthy recalled Falmouth head coach Eddie Cardieri asking how hard McCarthy threw. McCarthy didn't know the answer to, so McCarthy showed him. After a couple more questions, Cardieri was convinced and McCarthy was on the team. McCarthy then started slow, but by the end of the year was holding his own against some of the top hitters. Back at Brown, scouts were starting to call. The same faces started showing up. The calls were especially important because pitchers in the Ivy League weren't on set rotations. The scouts wanted to know when McCarthy was pitching. His coach Dave Stenhouse would then give McCarthy a heads up. McCarthy recalled one double header against Dartmouth. Highly touted prospect and future major leaguer Mike Remlinger pitched the first game for Dartmouth. The scouts stayed for the second game, getting to see McCarthy pitch for Brown. McCarthy took advantage by turning in a good performance, he recalled. Even with the scouts being around to watch him or other players, McCarthy said he tried not to pa that much attention. "I was serious because I wanted to do it, but I never focused on that or took that part of it all too seriously," McCarthy said, "because I figured if I did well it would all work itself out one way or the other." With that, it was the Reds who selected him. It came after his junior year and McCarthy made a deal with the Reds to ensure he would graduate on time. He played that summer and then returned to school in the fall. McCarthy's first stop with the Reds was rookie Billings. He called Billings a "wonderful first stop." The young players are learning to be professionals. The people, he said, were also supportive. McCarthy had the honor of the season's first start. It came at Medicine Hat and he recalled a lopsided win, like 18-3. "It was nerve-wracking, but at the same time I had pitched so many games in my life and been in so many games that it wasn't really an intimidating component of any of that." 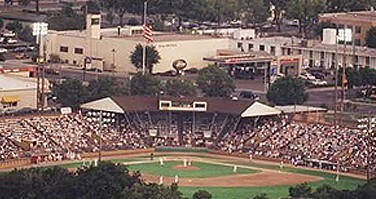 That season saw McCarthy's Billings Mustangs break the Salt Lake Trappers' record 29-game winning streak. McCarthy didn't get into that game, but he got to watch his teammates do it, including the guy on the mound for the win, Utah-native Quinn Marsh. McCarthy returned to school that fall and he finished up his degree by the next summer, as he'd intended. He then returned to the Reds and Billings for summer 1988. He recalled it soon became apparent that his degree might come in handy. That's because early on in that season, McCarthy tore his labrum. The cartilage tore. It was just a pitch that did it, he recalled. "It wasn't like a stabbing pain, but all of a sudden I threw the next pitch and it went 53 feet," McCarthy said. "I was like, 'that's weird.'" Another pitch went a little further, but not nearly far enough. "The catcher came out and was like 'stop goofing around,'" McCarthy recalled. "It was devastating news," McCarthy said. "It was a horrible situation." He was kept with the team and rehabbed through the summer. He got some outings in between, but the injury kept him from pitching well. Finally, after the season was over, he went home and a friend got him into see the Red Sox doctor. He was quickly diagnosed with the torn cartilage and had surgery.